I would like to learn more about this 2001 Ford Excursion Limited. Please contact me as soon as possible! 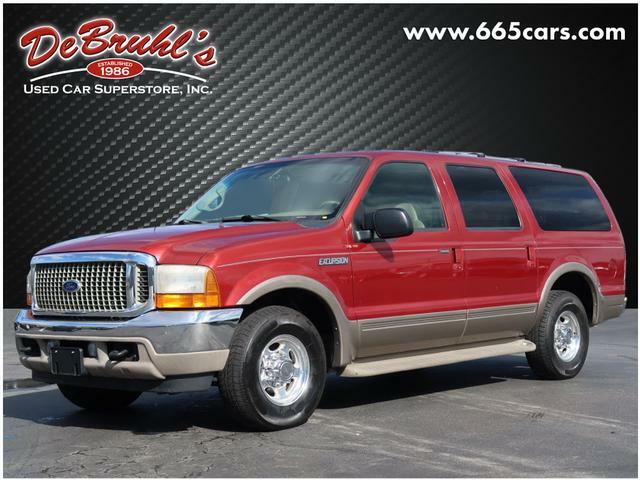 * 10 Cylinder engine * * GREAT DEAL AT $9,950 * * Luxurious Medium Parchment leather interior in this 2001 Ford Excursion Limited * * 2001 ** Ford * * Excursion * It comes with a 10 Cylinder engine. Flaunting a timeless red exterior and a medium parchment interior, this car is a sight to see from the inside out. Dont wait until it is too late! Call today to schedule an appointment. DeBruhls Used Car Superstore is the largest independent auto dealer in WNC! We offer a full range of financing with our guarantee credit approval, everyone is approved here.